What time of day do you run your UAS lights and Air pump? I've been reading over these forums for a while now, and I put into place an LED UAS a couple days ago. The scrubber consists of a 6x8 inch roughed up screen, Air stone and 7 LED's (One Red LED was damaged in the build, to be replaced) So currenly there are 5 3W Phillip Rebel ES 660nm Reds and there are 2 3W Royal Blue Phillip Rebel ES LED's as well. For the first day the light was on for 24 hours, because I didn't have it on a timer and forgot I had it running. I hooked it up to my controller last night and have it set to go on during the day for 12 hours on followed by 12 hours off. 1. What is the best time to run the scrubber? Opposite lighting schedule to my display or at the same time. Does the scrubber compete for nutrients if the lights are on in the display? 2. Do I leave the air pump running 24/7, or do you also have it shut down with the lights? Appreciate the knowledge. Love the site and stories! P.S - I'm feeding about 1 to 1-1/2 cubes of Food a day to my 120 gallon display, 40 gallon sump. Run the scrubber opposite your display tank lights. This helps to keep Ph steady. Some overlap of the DT lights and scrubber lights are OK.
Keep your scrubber air pump running constantly. 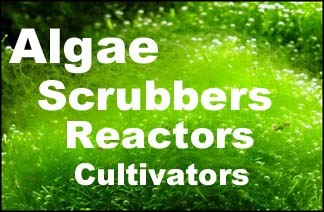 The dark period for the scrubber helps the algae grow. The scrubber competes with nutrients against any algae in your tank, so you can export Nitrate and other things. Even with the lights out, the algae is growing so it is using up stuff. Take a look at the recommendations for screen size, feeding, flow and light periods. I currently run my scrubber 18 hours on 6 off. Display lighting is 12 hours. My UAS and ATS run 24hours, I hope it's not too over..
From what I've read a darkness period is required for all plant life, even algae. Run the lights 18 hours, and the bubbles 24 hours.